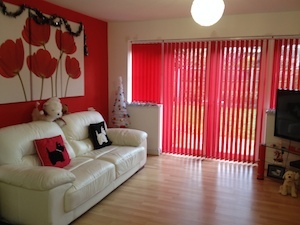 I moved into my own adapted flat in 2010 - I love it here; it's given me the space to be me and set things up exactly the way I need them to be. In about 2005 I put myself on the housing waiting list. It was now 2010 and I had heard nothng. I had the flu in the previous year and the flu bought with it some really bad muscle spasm (I remember I was unable to even bend my knees for about 3 days - my legs were just locked out straight in front of me). Because my body was so tense I couldn’t sleep and because I couldn’t sleep I was getting more tense. Eventually my doctor sent me to A&E and they prescribed Morphine to relax my body and help me sleep. After about 4 months I got back into a good sleep routine and the spasm started to ease. During that time mum and dad would lift me to transfer. We just got on with it and I always thought I’d be able to build myself back up. However because I hadn’t been taking my own weight and stretching my calf muscles/tendons, my ankles had become really weak and when I tried to take my own weight again they just gave way. So mum and dad continued to take my weight when transferring. Mum and dad are both in their 60s and they really started to struggling physically. My growing needs were taking their toll on my parents and my dad was to have a stroke the following summer. I had already been on the housing waiting list for many years, but in an attempt to get things moving I wrote to my MP about how desperate the situation was becoming. So in 2010 I did what my friend Matthew Law (who a;so has FA) had been encouraging me to do for years and write to my local MP. I explaIned my circumstanes, he forwarded my letter to the right people, and six months later I was in my own flat! Before you actually get in my flat you'd meet my first "can't live without" adaptation - my automatic front door (left). I can't coordinate my hands to use a key to unlock the door so I have an automatic door so all I need to do is press a button on a key-fob. 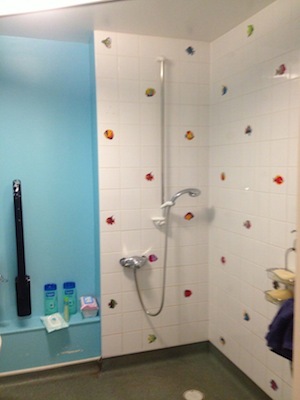 This is was for in part by my Housing Association and in part by a Disabled Facilities Grant. Once inside you have my hallway (below right) from which you can access all the rooms in my flat. All doors are wide ned and light switches are lowered/plug sockets are hightened throughout the flat (although I can control these using my Hive). As I can be heard in the hallway from each of the rooms I thought this would be a good place to put the intercom for my personal alarm system; I wear a pendant around my neck with a button on it which I can press at any time to speak to someone via the intercom. This way I can easily get hold of someone if I run into trouble wherever I am in the flat - whether I fall out of bed or get stuck in my powerchair in the kitchen. Inspite of the wall sockets being lined up in the bedroom indicating that the bed should go in the middle of the room, I pushed the bed in the corner creating a big space for my showerchair and powerchair. Social Services funded a track hoist over my bed which enables me to have one carer/PA instead of two. I control the light, lamp, wheelchair battery charger and fan on top of the wardrobe using my Hive. I also have an adjustable bed so I can sit up to read/watch tele or take medicaton in bed - I can't sit up on my own steam. 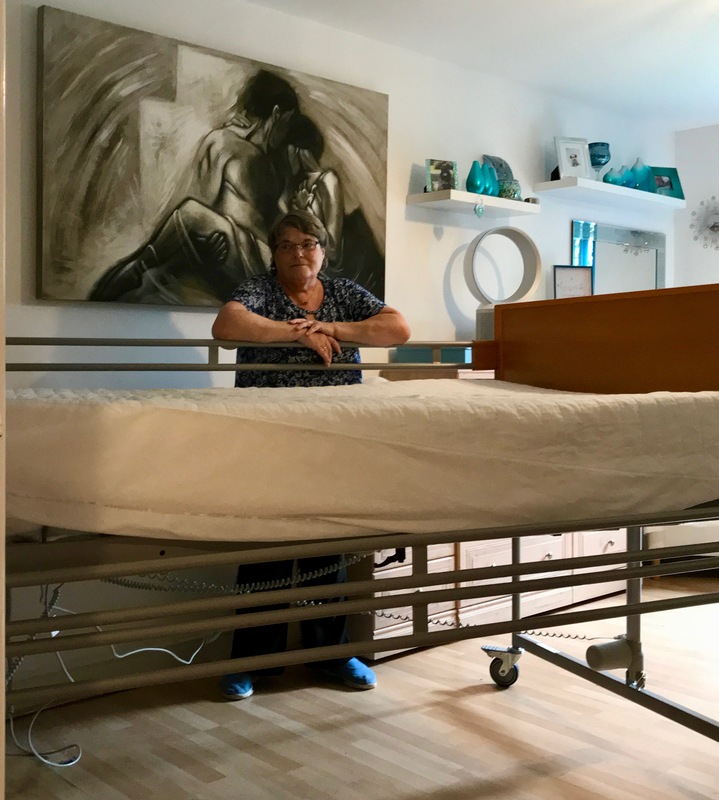 After repeated requests from carers/PAs whose backs suffered after hoisting me into a standard-height bed, I bought a height adjustable double bed from Betterlife from Lloyds Pharmacy. See pictures below. When I'm not very well and have a carer stay or I have friends over they stay in my spare room. I also keep my exercise equipment and standing frame in here (left). 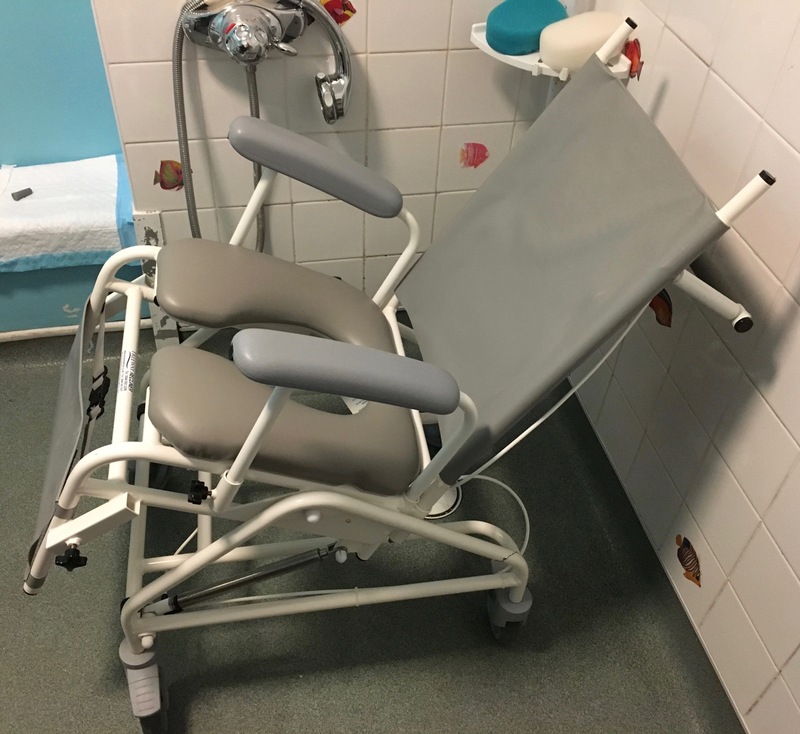 My bathroom is a large wet room and in here I use a tilting showerchair on wheels - the fact that it tilts makes it really easy to keep my balance in (pictured below). It has rails which I use to steady myself whilst sitting on the toilet. I use an electric toothbrush as I haven't got the coordination to use a manual on. I have a wide rail on the back of the door making it easy to grab hold of and pull to open or close the door. 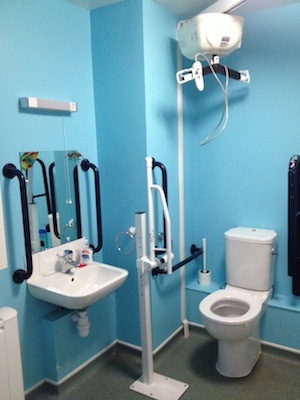 I have a track hoist and using this I can sit directly on the toilet. This was paid for with a Community Support Grant. See pictures below. The adjoining kitchen and living room creates one big space. In the living room (see picture below right) I have my computer and sofa around the edge of the room which makes for lots of room in the middle for me to move around. I turn the TV, lamps and fans on and off using my Hive. I ordered Dycem no n-slip from eBay which serves several purposes in this room; I put it under my keyboard and mouse, printer, fridge, freezer and microwave to keep them steady whilst I use them. I was awarded a Cornberg/Equipment and Adaptation Grant from Ataxia UK to assist the mobility of people with ataxia within their homes. I used this to buy electronic blinds. I couldn't open conventional curtains myself - having the remote to open, close and tilt the blnds throughout the day means that it’s a big part of my environment I’m in control of. In the kitchen I cook everything in the microwave. I empty things like porridge, pasta and warm desserts into a measuring bowl with a long handle before cooking so I can pull it out of the microwave when it's cooked by holding the handle instead of the hot bowl and once it's cooled I can hold the handle to steady whilst eating. I have Dycem non-slip in front of the microwave to stop things slipping and I use plastic crockery and cutlery with chunky handles. See pictures below. I actually stole this idea from a friend: I bought a standard kitchen apron - they're easy to put on and pull off myself whenever I eat or prepare food and cover my clothes completely saving them from any spills and crumbs. My apron also comes out with me any time I eat out and remember to take it! My Muggi sits on the drainer in my kitchen and every time my PAs come they leave four plastic tumblers each with water and a straw inside. 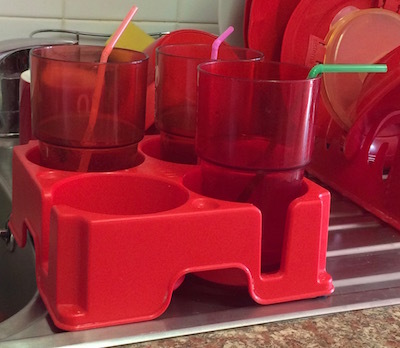 My Muggi works really well - I used to drop a lot more tumblers before I had it - it allows me to get my hands around the top of the tumbler and get a firm and steady grip of it before I lift it up out of the Muggi and towards me. I recently bought a second Muggi so that my PA can leave 8 drinks out for me when she comes in the morning so I'm all set for the day. My Morphy Richards sensor bin makes life so much easier! The lid opens automatically when I hover my hand over it so I can put stuff in it with one hand without fumbling around trying to open the lid. I mentioned the fun and games I had shutting doors from my powerchair in a Facebook status once. A few of my friends suggested tying a curtain tie to the handle, which I would grab the end of and drive backwards to pull the door closed. Subsequently I bought a curtain tie for each of my doors on eBay and it's turned out to be one of the greatest tricks I know!